Home Healthy PregnancyEating for 1.1	Can you eat fish while pregnant? Many women wonder if it’s safe and healthy to eat fish during pregnancy. Fish contain omega-3 fatty acids, B vitamins and are a great source of lean protein, making them an important part of a healthy diet, including during pregnancy. However, fish and shellfish can accumulate the environmental toxin mercury, which can be harmful to unborn babies and young children by harming nervous system development, leading to developmental and learning disorders. Some fish and shellfish contain higher levels of mercury, while some have relatively low levels. Knowing which fish are healthy for you and your baby during pregnancy is important. 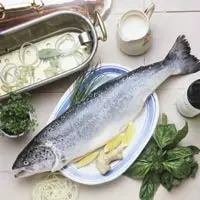 According to the FDA, if you’re planning on becoming pregnant, are now pregnant or nursing a baby, it’s safe for you to have up to 2 fish meals a week, or around 12 ounces of fish or seafood. recommended 12 ounces to allow your body to clear any excess mercury that may have accumulated. Commonly recommended choices include shrimp, catfish, pollock, salmon and canned light tuna. These typically contain lower levels of mercury. One exception to this is albacore tuna, which contains higher levels of mercury than other tuna. Therefore, limit weekly consumption of this type of tuna to no more than 6 ounces per week, if at all. When eating non-commercial, locally caught fish, try to determine if there is an advisory available about mercury levels and consumption recommendations for the waters in which the fish was caught. If none are available, then limit this type of fish to one 6-ounce serving per week and don’t eat any other fish that week. Avoid larger fish, which accumulated greater amounts of mercury. Fish to completely avoid include shark, swordfish, king mackerel and tilefish.